The recent update with regards to USA H-1B Visa has raised the concerns for tens of thousands of H1-B visa holders in the USA. The Department of Homeland Security (DHS) is said to be considering a proposal that will prevent the H-1B Visa Holders from extending their Visa, while their Green Card Visa application is in process. In the USA, the huge number of skilled workers are working on the temporary H1-B visa. This visa can be extended while your green card visa application is pending in the USA. Hence, at now there are thousands of skilled workers in the USA, who are living in the USA on this visa, while their Green Card application is pending for a long time. The USA Green Card or Permanent Resident Card allows the holder to live and work in the USA on a permanent basis. However, USA doesn’t easily allocate the Green Card to the foreign skilled workers as rules, requirement and process of the same are complicated. At now thousands of Green Card visa applications are pending in the US Immigration department, while the applicants are residing in USA on extended H1-B Visa. However, now the Department of Homeland Security (DHS) is mulling amendments in existing H-1B Visa policy. The new proposal may prevent foreign workers from getting H-1B visa extensions even if their green card applications are pending.If this proposal gets implemented, it will largely affect a huge number of Indians living in USA on H1-B Visas. Most of these people are waiting for their Green Card visa applications to get processed for a very long time now. In view of tightening US immigration rules, many H1-B visa holders are considering to move to Canada on PR visa. It is quiet justified too as one cannot plan the future, if he/she is not sure about his/her status as immigrant in the USA. On the other hand, Canada is the perfect country for immigrants looking for safe and secure career and life in an advanced nation. The permanent residency process and pathway is relatively easy in Canada compared to the USA. 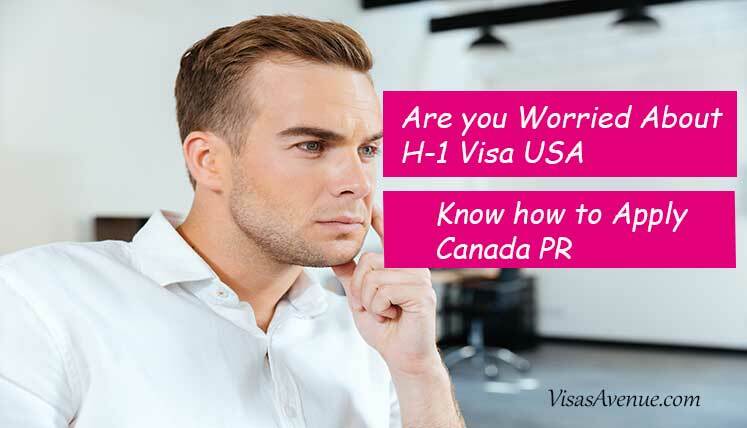 How to get PR in Canada as USA H1-B Visa holder? Federal Express Entry System of Canada provides best pathway to the foreign skilled worker to apply and obtain PR visa in Canada. It is a point based system, which assess your profile based on your age, education, work experience, language skills (in English or French), etc. and accordingly allocate you points called CRS (Comprehensive Ranking System) score. Applicants with highest CRS score get ITA (Invitation to apply) for Canada Permanent Residency (PR) Visa from IRCC(Immigration Refugees and Citizenship Canada). First of all, gather the key documents required to apply in Express Entry system, i.e. Your profile will be given a definite point score called CRS score in the Express Entry pool, based on age, education, language skills, etc. The IRCC will launch a draw every fortnight to choose the applicants with top CRS score. The cut off marks are announced for each draw. If you are able achieve the cut off marks in any of the EE draw, you will get ITA (invitation to apply) for Canada PR from IRCC. Gather all necessary documents and submit complete PR visa application within 90 days of the receipt of ITA. You also need to submit the medical report and Police Clearance Certificate during this period. Apart from Express Entry system, you may also choose Provincial Nominee Program (PNP), Quebec Skilled Worker Program (QSWP), to apply Canada PR from the USA. If you seek complete documentation process, support, assistance and help to apply for PR Visa in Canada through the express entry or any other immigration program, you may Contact Visas Avenue. It is the top and registered Canadian Visa and Immigration Documentation Consultancy firm in India. You may call the certified Canadian immigration expert at Visas Avenue on Toll-Free Number- 78-18-000-777 or e-mail your queries to info@visasavenue.com.